Microsoft has little goodies for 2007 Office System suite (all editions) and individual Office programs such as Word 2007, Excel 2007, Access 2007, PowerPoint 2007, Visio 2007, InfoPath 2007, OneNote 2007 and Publisher 2007 with new feature where Office 2007 provides ability to create and make a PDF copy of Office document or publish and convert the Office document into Adobe Acrobat PDF file format. Acrobat PDF format is the popular and widely used format for document sharing and transmitting, and previously, a third party utility such as Adobe Acrobat is needed in order to export or save or print or convert a document or workbook into a PDF format file. The free Save as PDF or Save as XPS add-in or plug-in is available for download from Microsoft. There is also individual Save as PDF and Save as XPS only add-ins or plugins available. Depending on your need, you can download the individual version of Save as PDF only as it makes no sense to download the combo version if one little use, since the XPS (XML Paper Specification) is less popular file format. Once download the Save as PDF add-in for Office 2007, install the executable and the setup will automatically add the Save as PDF function into your Office 2007 programs. Next, open the document that you want to convert to Adobe Acrobat PDF format, or prepare the document that you want to save in PDF format. Once done, click on the Office icon on the top left corner, and at the opened pane or drop down menu, locate and select Save As option. 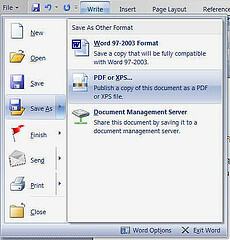 Once selected, there will be a Save as PDF or XPS menu option with description “Publish a copy of the document as a PDF or XPS file” on the right pane. Select this option by clicking on it to export and save your Office document in PDF format or convert Access database, Excel workbook, Infopath document, Word document, Visio drawing, Publisher drawing, Powerpoint presentation and OneNote file into PDF file.